Nitmiluk National Park is in the Northern Territory of Australia, 244 km southeast of Darwin, around a series of gorges on the Katherine River and Edith Falls. 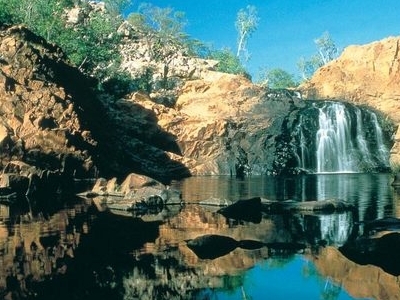 Previously named Katherine Gorge National Park, its northern edge borders Kakadu National Park. The gorges and the surrounding landscape have great ceremonial significance to the local Jawoyn people, who are custodians of Nitmiluk National Park. In Jawoyn, Nitmiluk means "place of the cicada dreaming". The gorges can be explored by canoe and flat bottomed boat. In the dry season the gorges become separated as the level of the river falls. They are interconnected in the wet. There is a visitor centre located at the Katherine Gorge, about 30 km east of the town of Katherine. Information displays are set up that explain the geology, landscape and aboriginal history of the National Park. Tours can be booked at the centre or at the visitor centre in the town. 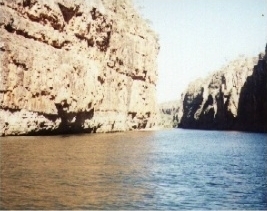 Katherine Gorge, a deep gorge carved through ancient sandstone by the Katherine River, is the central attraction of the park. Katherine Gorge is made up of thirteen gorges, with rapids and falls, and follow the Katherine River, which begins in Kakadu. During the Dry, roughly from April to October, the Katherine Gorge waters are placid in most spots and ideal for swimming and canoeing. There may be freshwater crocodiles in most parts of the river, as they nest along the banks, but they are harmless to humans. Saltwater crocodiles regularly enter the river during the wet season, when the water levels are very high, and are subsequently removed and returned to the lower levels at the onset of the dry season. Thus, swimming in the wet season is prohibited. Cruises of various lengths go as far as the fifth gorge. Here's the our members favorite photos of "National Parks in Northern Territory". Upload your photo of Nitmiluk National Park!